We are pleased to announce the opening of a new Escape Motions Community center! 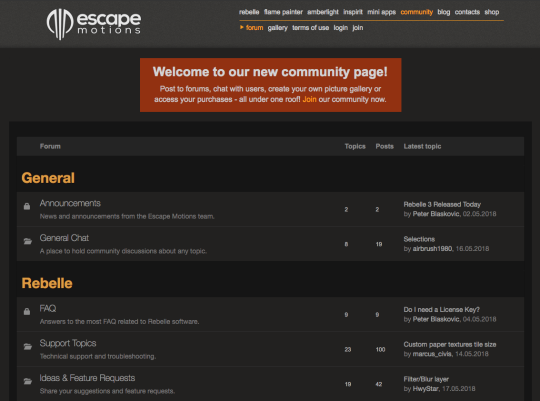 The Community is here to provide you with a friendly and helpful environment where you can discuss everything related to Escape Motions software in the community forum, post to community gallery and create your artist profile with portfolio, as well as access all your software purchases - everything under one roof! We have been receiving lots of questions and feedback about our software from you via different channels, such as email, facebook, twitter or instagram. So we decided to create a Forum - a place where such discussions can be easily organized and shared with everyone. Beside official announcements from Escape Motions team you can find a ‘FAQ’ and a ‘Support’ section as well as ‘Ideas’ or ‘Artworks’ threads for each and every software. The forum is a great place to ask questions about Rebelle, Flame Painter, Amberlight or Inspirit, get in touch with our support team, share your feedback, suggest and discuss new features, get a valuable feedback and critique for your work or have any other conversation. We had a Gallery on our website before but the new Community Gallery is created in a much more sophisticated way - you can upload your artworks directly from our software or from your profile. 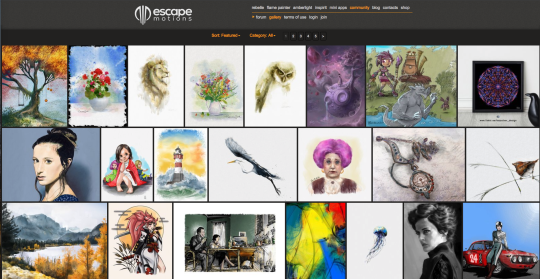 You can easily edit your artworks, upload new or delete those you don’t want in your portfolio any longer. What is more, fellow artists of the community can comment, like or share your work with credits so you get an instant feedback from others. Everyone who had an old Gallery account, don’t worry - your account registration is still valid for the new Community center. When you purchased Rebelle 3 you already noticed the new registration system - you were asked to create your username and password with which you can register Rebelle (no need for a long and boring key!). This password can be used to log in to our Community. We want to apply the same system for future Flame Painter, Amberlight and Inspirit too! If you don’t have a Community account yet, no worries - the signup process for is quick and easy - just click the JOIN button. If you join by entering the email address you used for purchasing and registering our software, you will be able to access the download links under PURCHASES tab of your profile. If you use a different email address, you can add the software you own afterwards. After you create Community account you can quickly edit your artist profile - let others know where you are from, add your social media and write a short bio about who you are, what you like to create or anything else you’d like to share with the outside world.